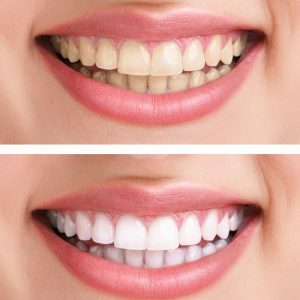 Teeth whitening involves gently bleaching the teeth, so they gradually lighten by several shades. We provide a safe and simple way to whiten your teeth with our Teeth Whitening Home Kit. It only requires two short appointments, the first to ensure your teeth are suitable for the treatment i.e. you have no gum disease or crowns. If you are a suitable candidate, we’ll take impressions of your mouth to make your whitening trays. The second appointment is to fit your trays, ensure that you know how to use them and answer any questions you may have before you start the treatment. Treatment lasts 6 to 8 weeks and the trays can be worn for a maximum of 1 hour a day. Yes, when carried out by a dentist or registered dental professional, it is a safe and effective. The results of the whitening treatment can last up to three years, depending on the individual. If you smoke or consume a lot of food/drink that is likely to stain teeth the length of time will reduce. For information on prices see here or speak to the team today on 01792 642733.